In the last post, we discussed the quantity of alum necessary to marble with watercolor and acrylic pigments on paper. There is another class of pigments that can be used for marbling, and was historically an important source of particular hues. These are lake pigments, made from natural dyes. As both a marbler and a natural dyer myself, these pigments are of great interest. Natural dyes (with the exception of vat dyes including indigo) are water soluble. This means they cannot be used for marbling, as they simply dissolve into the size. In order to make these beautiful organic colors, many of which have no counterpart among mineral colors, useful for marbling they must be converted into pigments. A lake pigment is made when dissolved dye is precipitated onto an inert substrate - often potash alum. The precipitate is then filtered, washed, and ground. 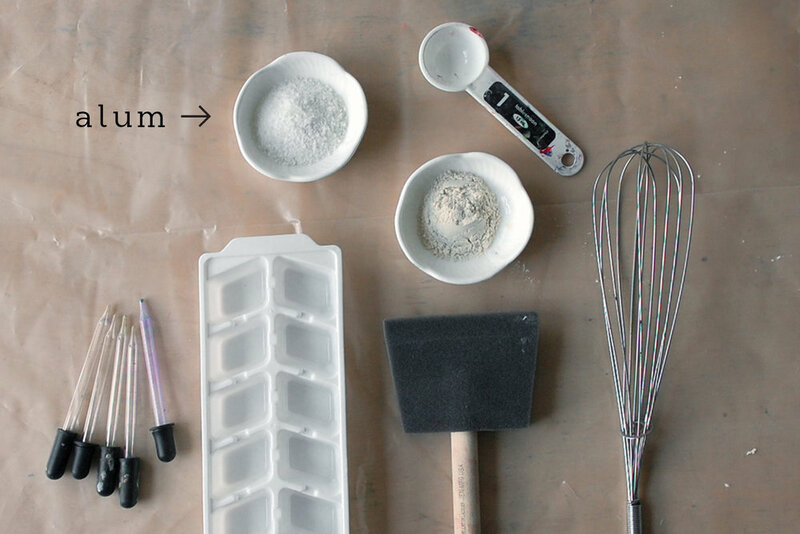 For marbling it can be mixed or mulled with a binder, usually watercolor medium, and used like any other watercolor paint. If you've ever used the all-in-one dyeing method of mixing mordant, dye, and fiber in one pot, you may have noticed some of the dye spontaneously settling to the bottom. This means the dye and alum have bonded together, making a lake pigment. What role does alum play in lake pigments? As we learned about alum, it readily bonds to dye molecules, making it a substrate well suited to the formation of lake pigments. Other mineral mordants can function the same way, such as tin and copper salts. Each of these mordant substrates acts to stabilize the dye compound, improving its lightfastness. And just as with natural dyes applied to fabric, the choice of mordant and pH can strongly affect the shade of a lake pigment. The example below is a lightfastness test of homemade lake pigments( yes, I need to practice patience in grinding pigments). On top is madder lake with copper; below it is weld lake with a little indigo, mixed as watercolors. The left side was exposed to direct southerly sunlight for one month, and the results I think are quite promising. Unfortunately lake pigments suffer from a bad reputation because they are not as permanent as their modern synthetic replacements or mineral pigments. Some lake pigments are certainly fugitive, and care should be taken to keep artwork made with them out of direct sunlight. The most lightfast pigments are made from the most lightfast dyes, such as madder, buckthorn, and weld. Because lake pigments contain a mordant within them, paper does not need to be pre-mordanted before marbling! I have read this in multiple sources, and the test below confirms it. The mordanted paper absorbs the marbled print a bit more quickly with a slightly sharper quality, but this shows that pre-mordanted paper is not a requirement. Lakes are prepared for marbling just like any other watercolor pigment: each color is thinned to a good consistency and mixed with the appropriate amount of surfactant. You don't need to go through the trouble of grinding your own pigments to enjoy working with lakes, any 'genuine' watercolor lake such as rose madder or carmine will work. It can be difficult to know just what manufacturers put in their paints, and whether they are synthetic pigments simply bearing the names of historical shades, so it's worth seeking high quality paints if you want the real thing. If you are marbling with a mixture of genuine lakes and pigments from other/unknown sources, pre-mordanting the paper is advisable. In addition to lake pigments, I've read that any genuine earth pigment may be used for marbling without a mordant, as earth pigments are composed of minerals. It is clear from natural dyeing that ferrous salts are a very effective mordant, so the iron present in earth pigments should work the same way. I hope to test this in future, and make a comparison of the lightfastness of these samples. Update: After 1 month of exposure to direct sunlight, no fading has been observed in samples printed on mordanted and unmordanted paper. The alum and chalk present within the lake pigments appears to stabilize the dye colorants admirably. Please feel free to contact me with any insights or sources for historical pigments! How much alum to use? Marbling instructions vary greatly in the strength of the alum solution recommended to mordant paper. I've seen measurements ranging from 1.5 teaspoons to 5 tablespoons per pint of water. Let's investigate just how much is enough to make a successful print. 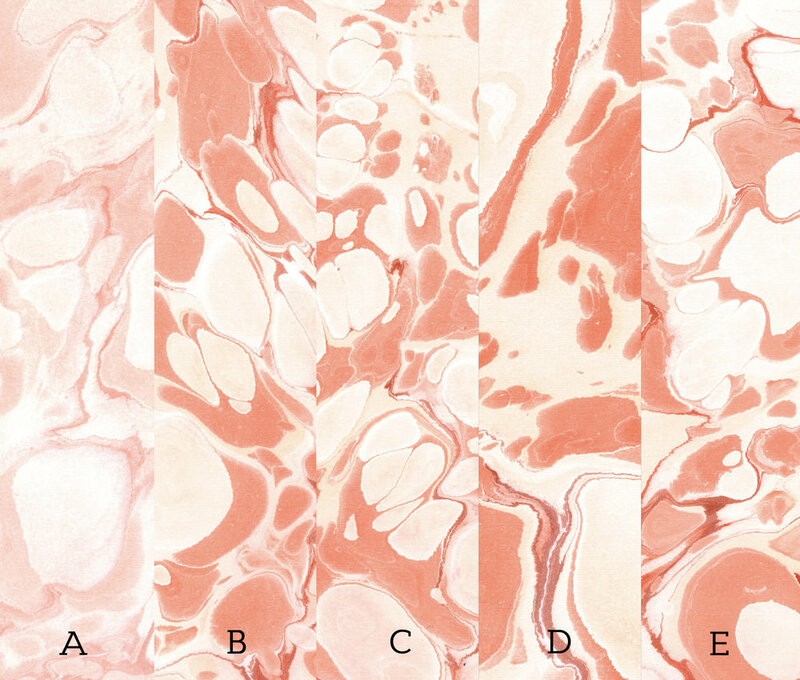 If too little alum is used, marbled designs made with watercolor or acrylic pigments cannot bond to the paper. Western-style papers used in the European marbling tradition are sized to improve their durability and slow their absorbency. Alum bonded to the surface of mordanted paper is the chemical helping hand essential for linking marbling pigments to the paper fiber, and stabilizing the colors for lightfastness in the long term. Any marbler who has accidentally printed on the unmordanted back side of a sheet is familiar with the disappointment of watching their design wash down the drain with the rinse water, having no alum to hold it fast. However, if too much alum is used, crystals may build up on the surface of the paper without actually adhering to to the paper fibers. In this case a bit of the excess alum will dissolve into the size as each print is made. If the size becomes polluted with alum, it causes the paint to clump together in a very frustrating way, and must be replaced with fresh size. * If you can feel a buildup of powder on the surface of your paper or see white streaks on colored papers, you are using too much alum. Additionally, alum is acidic, and using a lot will both waste alum and make the paper overly acidic. Over time, this causes the paper fibers to become brittle and crack apart. As can be seen in both the watercolor and acrylic tests, unmordanted sample A is comparatively very pale. This was not a surprise, as it has no mordant at all. I was surprised, however, to find no discernible difference the in strength of the colors in samples B-E. Any quantity of alum from 1.5t - 3T per pint acts as a successful mordant. I will continue using 1.5t/pint to mordant papers in future, the amount recommended in the first marbling class I took with Stephen Pittelkow. As alum is slightly acidic, I prefer to put as little as needed on my paper to get the job done. Pre-nineteenth century marblers used potash alum, but nowadays you can mordant with either potassium aluminum sulfate or aluminum sulfate - just mix it with warm tap water to ensure the crystals are fully dissolved. Some marblers soak their paper in a mordant bath, some apply the alum solution with a natural sponge or a spray bottle; I use a wide foam brush. As each sheet is coated I flip it over and pencil an X on the back. The whole stack of wet papers is weighted with a heavy board to stay flat. They can be printed in about half an hour when still slightly damp, or kept up to 4 days. I prefer to print papers within one day of mordanting. If you've prepared your papers with mordant but the marbled design doesn't adhere, you may be using archival paper coated with calcium. Choose a different paper stock and try again. *Of course, any mistake can become an interesting pattern when repeated intentionally! Mixing a little bit of alum into your gall water or one color of paint can give an intriguing, crunchy texture to a marbled design.